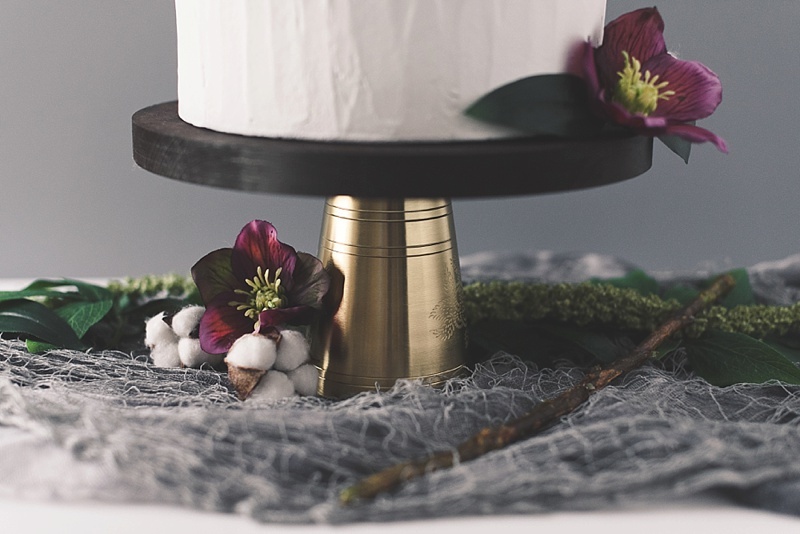 It was only a matter of time before we created a do-it-yourself cake stand tutorial because we basically live for wedding cake and think any celebration requires the sweet stuff! 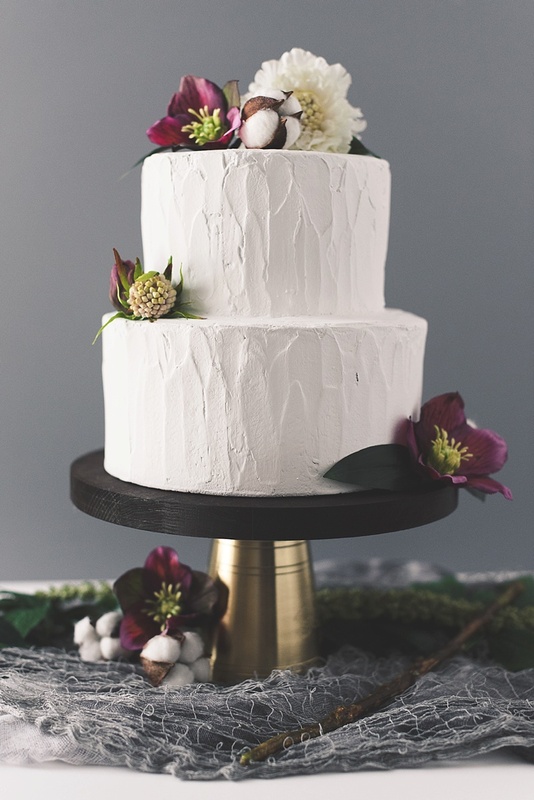 Inspired by a little rustic and a little vintage aesthetic, we've crafted up a beautiful project that is set to make your cake or dessert table extra special with your handmade touch. Using a wooden plaque and a pencil cup (yes, you read that right! 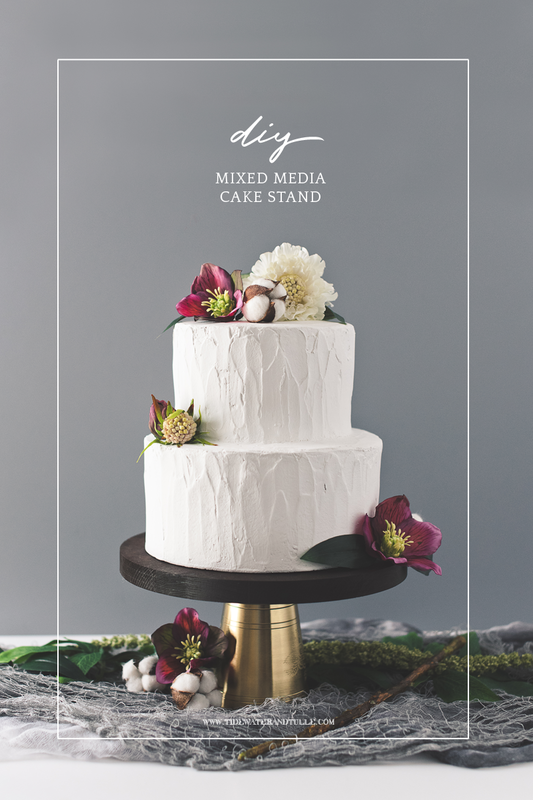 ), you can create a unique pedestal for your special day. Not having cake? Internally, our cake-loving hearts are broken, but we still love you because, heck yes, this project is perfect for any pies, cookies, and anything else that you can dream of to satisfy your guests' sweet teeth. 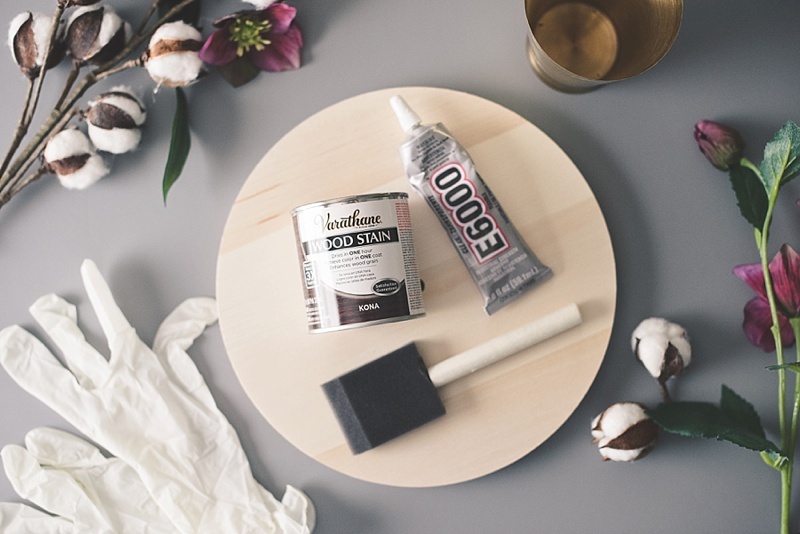 According to finishing expert Bob Flexner, all wood finishes are food-safe once they have been fully cured, including polyurethane varnish (like the one used in this tutorial). The rule of thumb for full curing is 30 days at room temperature, so be sure to do this project at least one month before your big day. If you must make it less than 30 days, use a cardboard or wax paper circle underneath your wedding cake. 1. Prepare your workspace by covering with a plastic garbage bag or plastic drop cloth. Wood stain can be very messy! Read your wood stain's instructions before getting started just in case there is a particular step not covered in this tutorial. 2. 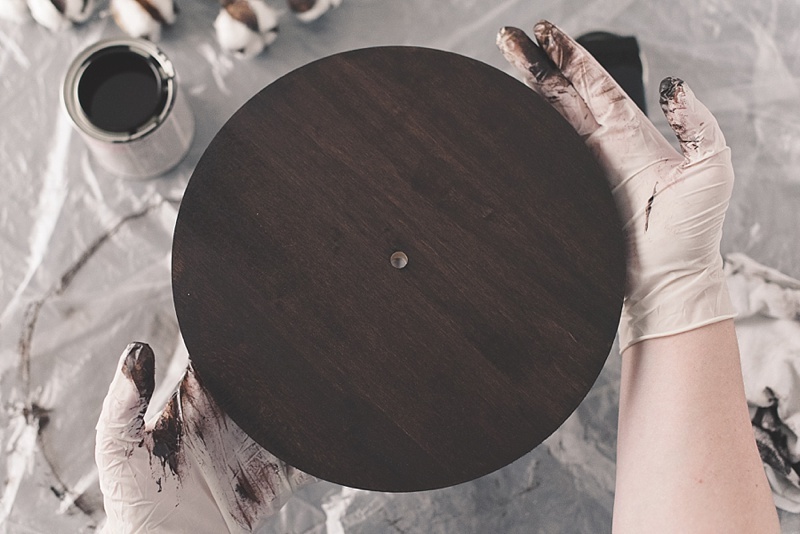 Shake your can of wood stain well and open the metal lid with a screwdriver (or even your nail clipper's handle). 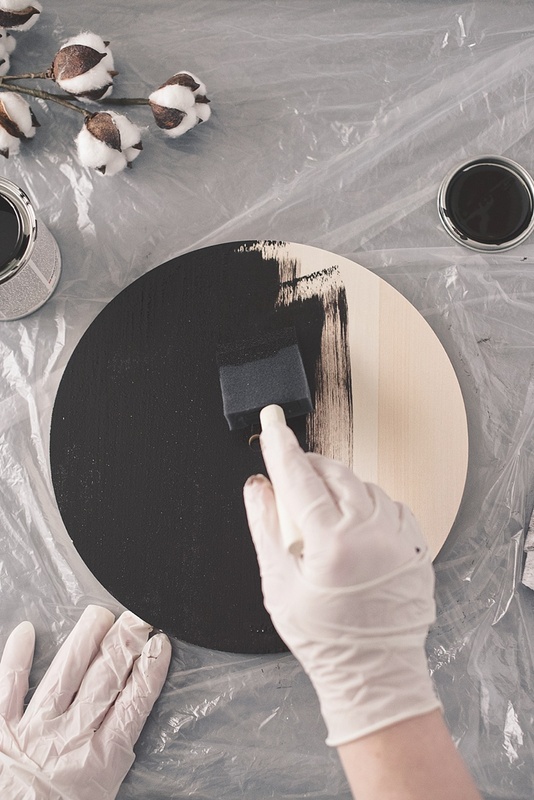 Using your foam brush, dip into the stain, wipe off excess on the can's rim, and paint one side of your wooden circle plaque. There is no right or wrong way to do this, but we recommend painting along the grain of the wood. After you've covered one side of your wood, let it dry for 2-3 minutes. The longer you leave it, the darker your stain will be. 3. 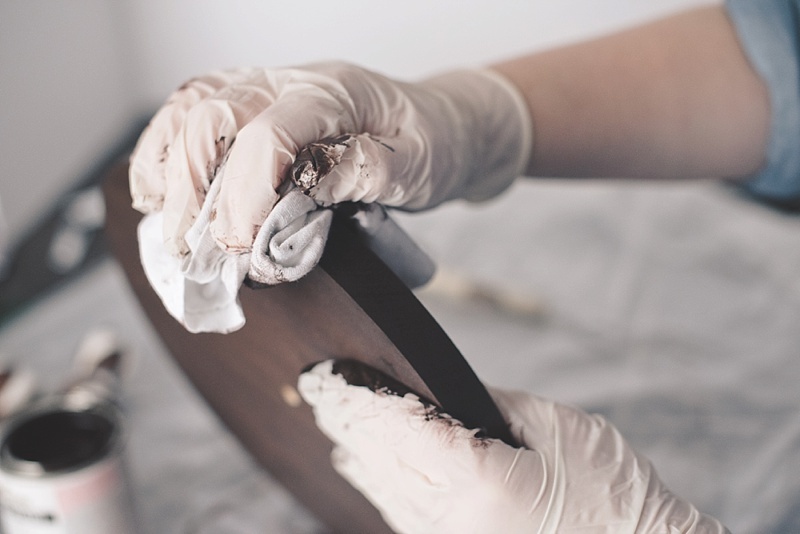 Once dried to your preference, take your old rag and wipe the excess off of your wooden plaque going along with the grain. You will start to see the beautifully stained grain come through as you wipe. Wipe and rub thoroughly being mindful of the direction since it will show how you remove the excess stain. 4. Repeat steps 2 and 3 for the other side of the wooden plaque as well as the edge. 5. 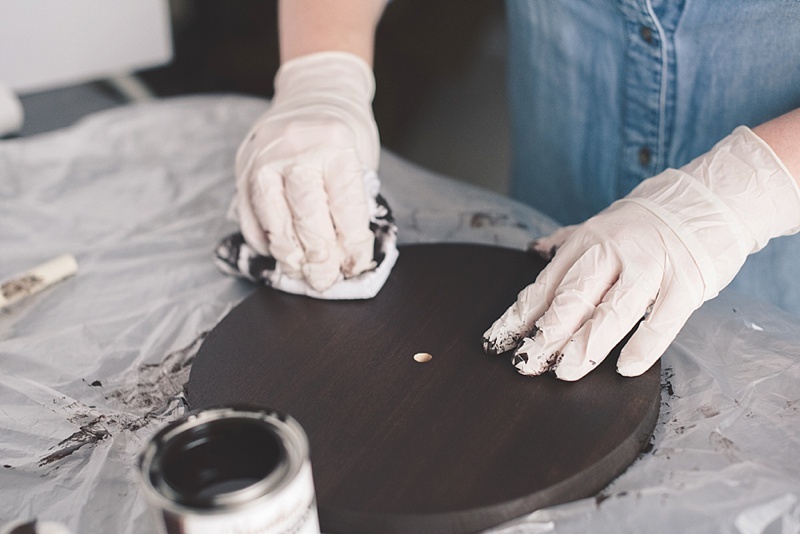 After you finish rubbing off the excess stain on all sides, let the wooden plaque dry for 1 hour. Let dry for longer if you're in a humid area. 7. 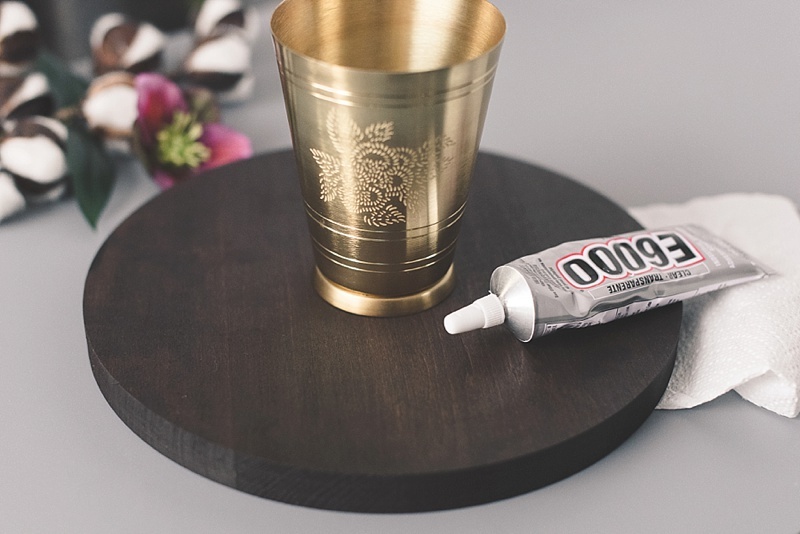 After everything is stained and sealed, use your E-6000 glue and carefully line the edge of your pedestal (or in our case, gold pencil cup). Dry upside down (as pictured) to avoid any potential drips. Place a book or heavy object on top to give good weight to the drying process. Set it and forget it for at least 12 hours. 8. As mentioned above, be sure to let your cake stand cure for 30 days before using with any food. Once the big day rolls around, it'll be ready to shine on your dessert table! Want to Add to a Non-DIY Option To Your Dessert Table?